Wada Farms is a member of The Produce Moms family of partners. Enjoy perfect steakhouse-quality baked potatoes at home. There’s nothing quite like a steakhouse baked potato. Have you ever wondered how steakhouses get their baked potatoes to taste so good? 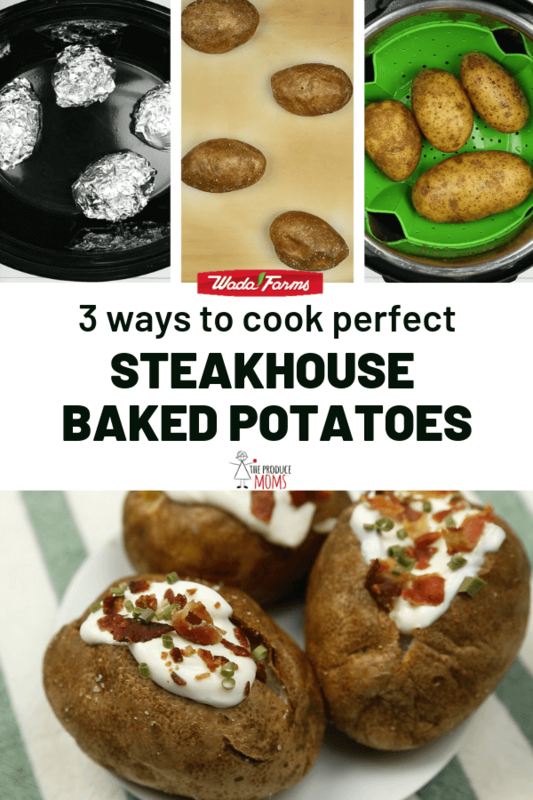 We’re letting you in on the secret, plus sharing 3 different cooking methods to make your own steakhouse-quality baked potatoes at home. 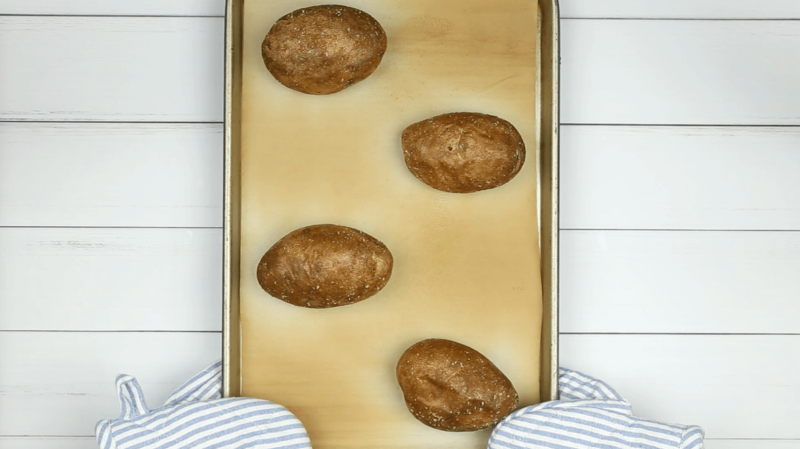 The secret step to making a delicious, steakhouse-quality baked potato is to drop the potato onto a plate or hit it in the middle several times with the palm of your hand. Why? This loosens up the inside of the potato so it’s nice and fluffy inside. Regardless of which cooking method you use, be sure to incorporate this step for the perfect potato! Enjoy an oven-baked potato with a salt-crusted skin. Skip the aluminum foil to achieve a crispier skin. Rub washed potatoes with olive oil until it is well-coated, sprinkle with salt and pepper and place on a baking sheet. Roast the potatoes whole (don’t poke any holes in it) until it is soft when you squeeze it with your hand. Baking time will depend on the size of your potatoes (typically 45 minutes to 1 hour). When you take the baked potatoes out of the oven, drop them onto a plate or hit it in the middle. By dropping or hitting them, you loosen the inside of the potato so it is light and fluffy inside when you cut into it. Cut a slit down the length of each baked potato, pinch the edges together to make the opening bigger, and fill with desired fillings. If you like your baked potatoes to have softer skin, choose this method. Wrapping the potatoes in foil and cooking them in a Crock-Pot will result in tender, soft skin. Wash potatoes and poke each several times with a fork. Rub potatoes with 2 tablespoons olive oil and salt and pepper to taste. 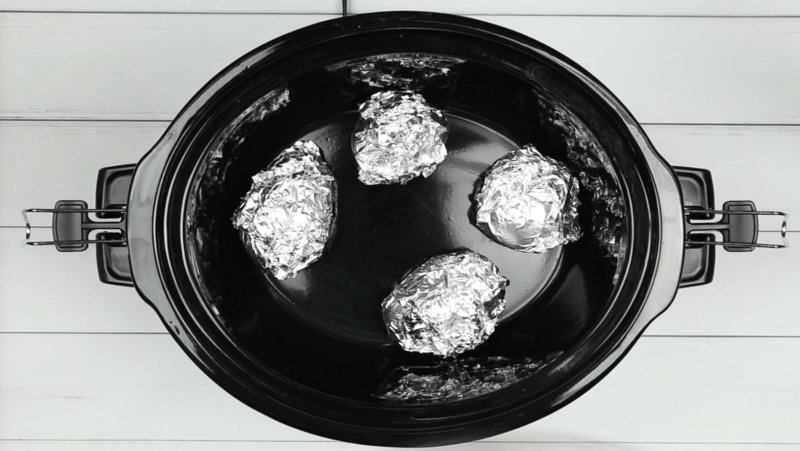 Wrap each potato in aluminum foil and place in slow cooker. It is okay to stack the potatoes. Cook for 2.5 to 3 hours on high or 6 to 8 hours on low. Cook time will depend on the size of the potatoes. When potatoes are fork tender, turn the slow cooker to warm. When you take the potatoes out of the slow cooker, drop them onto a plate or hit it in the middle. By dropping or hitting them, you loosen the inside of the potato so it is light and fluffy inside when you cut into it. Want a beautiful baked potato in a hurry? Then the Instant Pot method is for you. 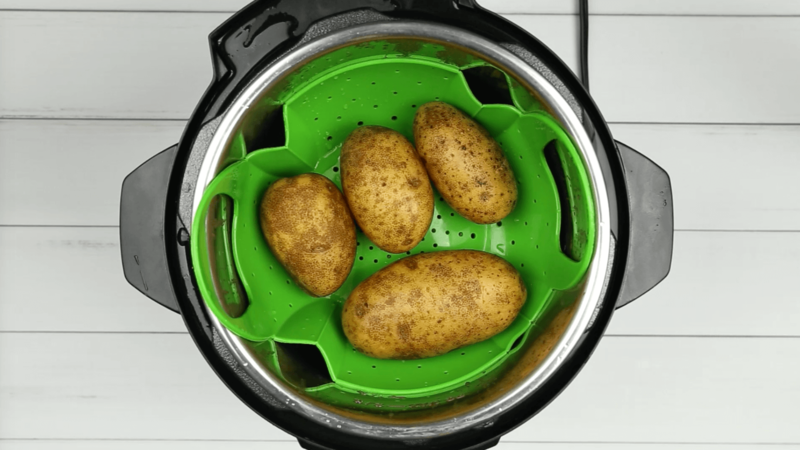 Cooking potatoes in an instant pot cuts to cooking time by more than half! Just be sure that the potatoes do not touch the water in the Instant Pot, otherwise, they will get mushy instead of fluffy. Place 1 cup of water in the bottom of the Instant Pot (or pressure cooker). Place a rack or steamer basket over the water. The water level should be lower than the rack. Poke each potato with a fork in 3-4 places. Rub each potato with olive oil, just enough to lightly coat it, and a generous amount of salt and pepper. Place the potatoes in the steamer basket and set pressure cooking setting to high. Pressure cook on high for 16 minutes. If your potatoes are larger than 14 ounces, pressure cook for 20 minutes. When you take the baked potatoes out of the Instant Pot, drop them onto a plate or hit it in the middle. By dropping or hitting them, you loosen the inside of the potato so it is light and fluffy inside when you cut into it. OPTIONAL: To crisp the skin, place the potatoes directly on the rack in a hot oven, convection oven, or toaster oven for a few minutes. For the very best baked potato, it’s important to start with the very best quality potatoes! Wada Farms has been growing world-famous Idaho Potatoes since 1943. Decades of farming experience have yielded their reputation as masters in their trade. Their quality processes go beyond industry standards, which result in consistently delicious potatoes you can count on. Learn more about Wada Farms and all of the produce they grow here. Learn about their organic potatoes, which are available year-round, here. February is National Idaho Potato Lover Month. 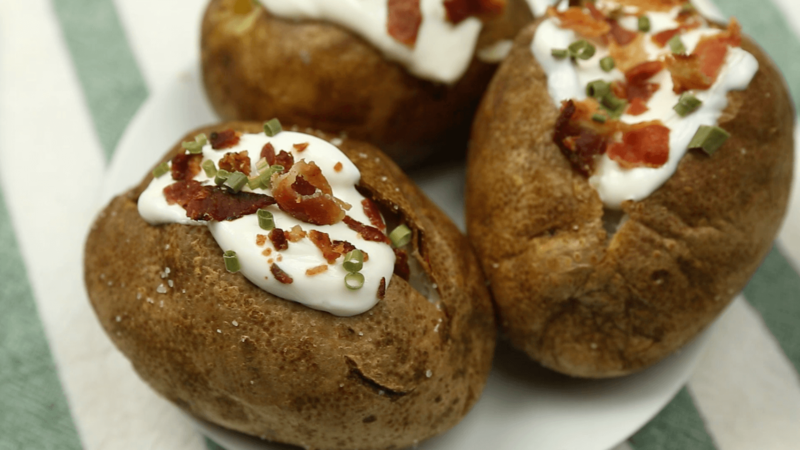 Celebrate with perfect steakhouse baked potatoes… at home! What are your favorite baked potato toppings? Share in the comments below!